We all know how every parent has a special place in their heart for their first born. 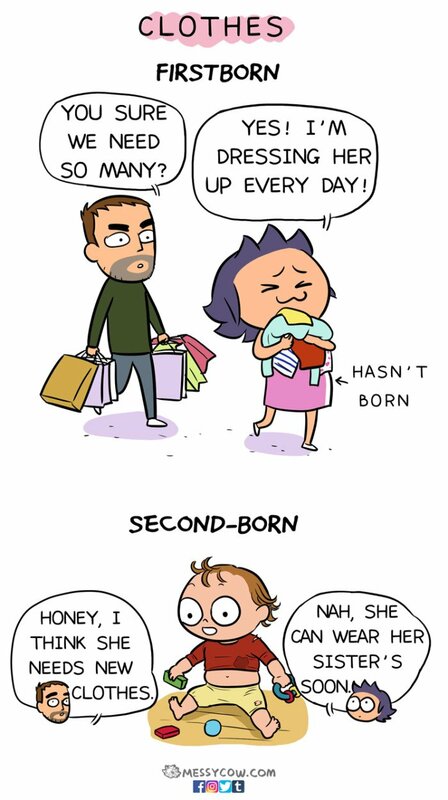 Not just while comparing with their second-borns but the firstborn is actually treated their whole life differently. 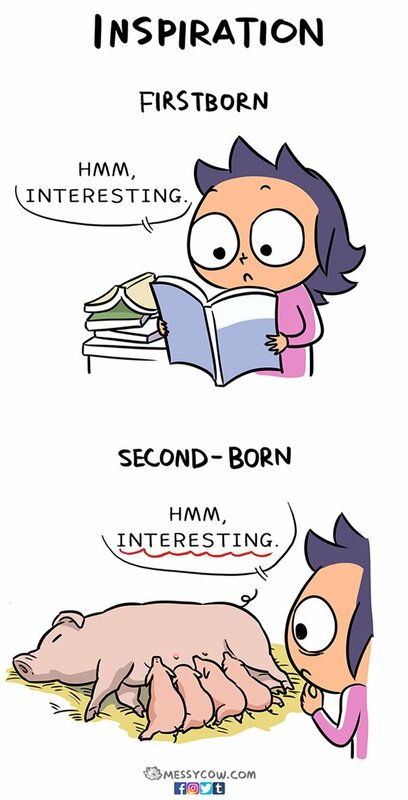 All the way from conceiving the first child to how the mothers are treated and how the kids are raised with so many precautions and care yet not so much with the second-borns, Weng Chen has shown us all of it through her illustrations, and it is absolutely hysterical. Weng Chen is an artist, VR game designer and above all, a mother all the way from China living in the United States. She tells us on her website how she became so close to the world of art. When I was about 2, 3 years old, my mom drew me a little mermaid and told me the story. I was fascinated, it was like magic that the most beautiful picture just came from my mom’s pen. I believe that was when I fell in love with drawing and storytelling. She has been recently drawing comics mostly about her daily life revolving around her two beautiful daughters, Electra (first-born) and Ali (second-born). Messycow comics were started with an impulse. I didn’t spend any time designing anything, just dove in and started drawing. As mentioned above, Chen brilliantly distinguishes between the experiences of having a first born and a second born. Check out the difference for yourself! 2. It’s all about appreciating their efforts and encouraging them. 3. Funny how they stress so much over cleanliness for the firstborns’ yet they are so comfortable with the other ones licking almost everything. 4. Less worry, less drama. 5. Not exactly peeled grapes but yes, you are treated way better the first time. 6. This happens in literally EVERY home. Clothes bought for the upcoming decade. 8. Eventually, you are thankful to God even for second-hand-used toys?! 9. When you just want to get rid of all the ‘useless’ responsibilities and hand them over to gadgets and media. 10. Just look at the difference. 11. I think it’s more about the parent’s hobbies rather than the child’s. 12. But then it’s actually all about the experience, no? 13. Trust me; it gets worse with time. 14. Told you, their love for their firstborns is eternal! 15. There are other ways to gain knowledge of pregnancy and post-pregnancy period as well. Not trying to make anyone feel bad or anything but if you are a parent, you would totally realize this. Do let us know your views on whether you agree or disagree with this post. Cheers!